Martes zibellina or martes americana also referred to as Canadian sable belongs to the genus of true marten. 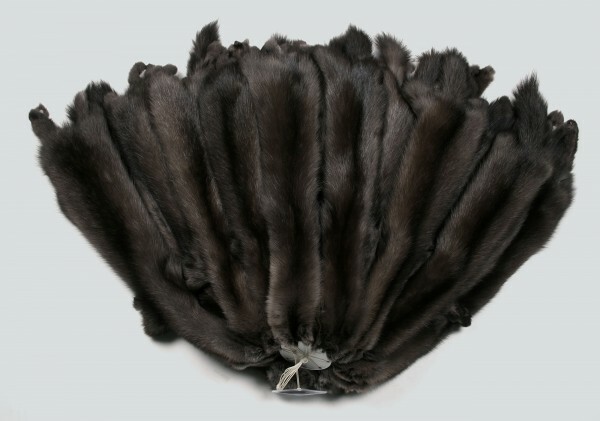 For more than a thousand years sable fur has been considered as a treasure. The Russian sable is about 35 to 45 cm tall; the tail has a length of 12 to 15 cm. The soles of the feet are hairy. The sable lives mainly in the forest; rather on the ground, rarely he climbs trees. Sables are mainly found in medium altitudes, especially in spruce and Swiss pine forests, sometimes in swamps with trees. As early as 1931, the breeding of sable began in farms. Today, 90% of the sables are farmed sables. The name depends on their origin, e.g. Barguzin, Kamchatka, etc.. The coloring is predominantly dark brown with shades of deep dark brown to light and brown yellow. Professionals speak of "water". The more uniform and darker the "water", the nobler the hair coat. Related links to "Bargusin Sable Skins - MIB Dressing (Sojuzpushnina)"
Customer evaluation for "Bargusin Sable Skins - MIB Dressing (Sojuzpushnina)"